On vacation and looking for a unique dining experience the whole family will love? See what the locals have been raving for over 25 years with this downtown Steamboat tradition boasting the best chef in town, you! The 8th Street Steakhouse has the finest dry-aged handcrafted steaks from Colorado Buffalo, Prime-grade NY strips, 18 oz. Bone-in Ribeye, bacon-wrapped filets to Wagyu Kobe Beef. With steaks starting at $16.95, including unlimited salad bar and Texas toast, you’ll still have room for our famous 8th Street Tater for dessert. This is truly a restaurant not to be missed!! With a magnificent Western ambience, our restaurant is focused around our two 20-foot lava rock grills where our patrons season and sauté their steaks to perfection. With the help of our friendly staff making sure their wine is filled and steaks turn out perfect, it’s no wonder we've been a steamboat tradition for over 25 years. Let us make your steamboat dining experience one to remember tonight! Our unique dining style is perfect for wedding rehearsals, ski clubs, team functions, corporate events, or any other reason your group of 20 to 150 is not only looking for a great steak, but a great experience to go along with it!!! Our upstairs balcony seating is perfect for groups of any size and offers private salad bar, meat case, and grill. Our unique grill-your-own style allows guests a more "social" dining experience typically preferred with large parties. We also have the ability to create a menu to fit any group size and budget. 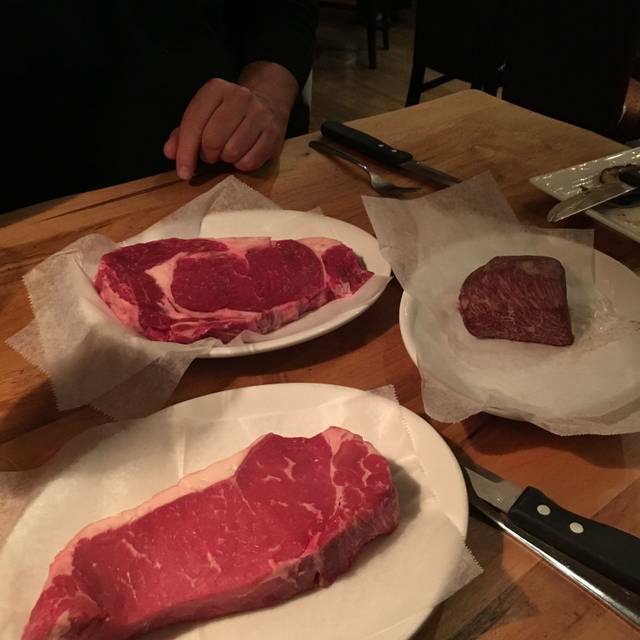 USDA Prime NY 16 oz. Mussel & Martini Night every Thursday! Great experience cooking your own choices of meats and lots of fun as a group- we were six. The food was excellent and we pretty much managed to cook all our steaks the way we like them. Minor gripes, the sides, fries etc didn’t arrive until we were half way through our steaks and it wasn’t particularly busy. Second they were too keen to close up and were putting chairs on tables and sweeping the floor around us whilst we were still eating and drinking, not really what you expect even if it is their last skiing week. Best steaks we had in Steamboat. Great fun to BBQ yourself. Staff are all very helpful and welcoming. We visited twice in 6 days! This was a fun restaurant and the food was delicious. My only complaint was the fact that they were out of filets when it was time for me to pick out my steak. But the New York strip was delish in its place. Last year we were on the first floor and loved it and would highly recommend. Food was great and my son could not wait for another bison steak. This year we were upstairs, the grill was packed, too loud to visit and the wait was forever. It is a little over priced for the food. The price on the steaks was high enough to have included at least one side. Always great seeing Tim and Mary @8th. Had out wedding rehearsal dinner there in 2012 and continue to go back and see our friend. Excellent, friendly service, have been a loyal customer since 2006! For 30 years we have becoming here as a family, first Boomerangs and now 8th Street Steakhouse. Steaks are great, all you can eat salad and great family time around the grill as you grill your steak. Highly recommend this establishment. Very enjoyable cooking your own meal. Salad bar well stocked and the meat selection was great. Even could grill vegetables. Really thought the prices were high for what you received. The place really needed a good cleaning also. One of those “been there done that” places. $38 for a steak that you had to cook yourself with no sides really was a bit excessive. Service was good though and the food was good. Fun getting to choose and cook your own meats. Great food and atmosphere!!!! Will go back someday. Fun concept cooking your own steak! Sides came out too early and were sitting on our table while we were still grilling so they got cold. Pricy for having to grill your own. We went there with 4 adults and 3 children 2, 4, and 6. Family friendly and you get to grill your own steak. Delicious. The steakhouse was a lot of fun! It was nice to have a night out in a different way. All the steaks looked so good it was difficult to decide. Only come to this place if you want to have minimal service. You serve your own salad via salad bar, then you order overpriced meats that YOU HAVE TO COOK YOURSELF?????? The cooking times are way off. 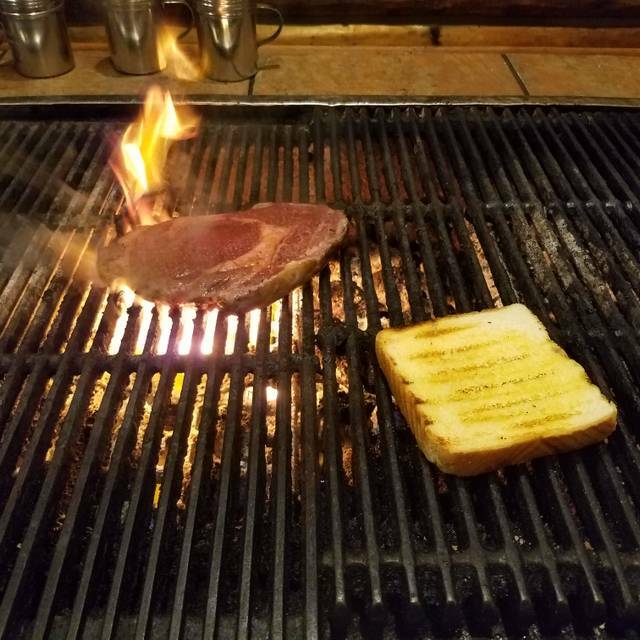 When we told the person who served us a raw steak and told us how much time to cook it that the times were off, he admitted that the grill was not great. We had to stand over a hot grill for 20+ minutes to get a medium steak. I’m just seriously confused how this place exists/why anyone would pay to go to a restaurant and cook your own overpriced food and and then be expected to tip on top of that. We only came because a family member really wanted to check it out but rest assured we will not be back. I frequent good steakhouses often and was disappointed at this one. It is more of a gimmick as far as cooking your own food. The steak cuts were mediocre. I wish I had tried another steak restaurant in the area. Food was good except for the creamed spinach. Might think about having small children be allowed to cook their steaks. We didn’t know we would have to cook our own steaks and sautéed veggies ourselves, NOT. a plus. Our server Shawn was awesome! We thought the restaurant was exceptionally clean and the food was over the top. Great cuts of meat and my wife said the Crab legs were awesome! The staff was friendly and accommodating, plus the over all cost was very moderate for a tourist town. Make this restaurant one you do not miss!! On vacation with family and friends. Outstanding food and do much fun!! We made a reservation and even showed up a few minutes early. We then had to wait about 40 minutes to finally get set. Oh, you will also pay a normal price for a piece of meat but then YOU get to grill it. Place could be cool but its way over priced for grilling your own food, a very small salad bar, and getting your sides well after you have eaten your meat. Not the best experience. Great ambience and good food - cooked by YOU. So if you do go, ad a minute or two per side to the recommended times. 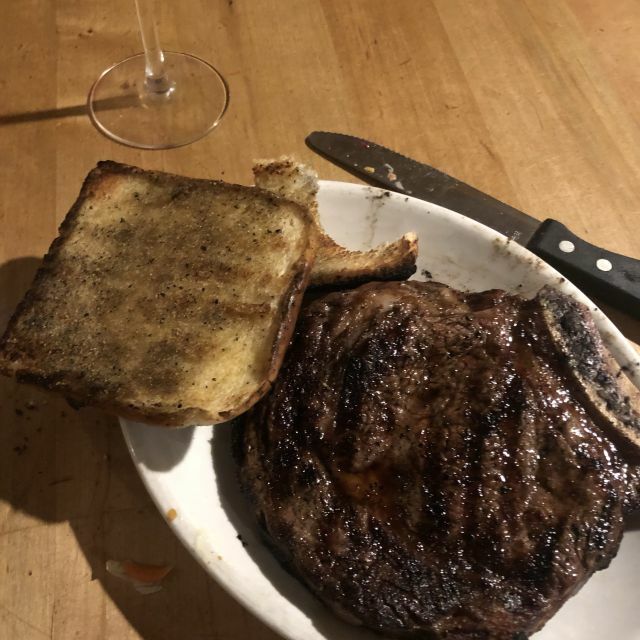 I grill a lot at home and still my steak was a bit rarer than it should have been (and I like rare meat). I only have myself to blame or I wasn't sure of the grill temperature or I was concerned I might have overcooked it or I was distracted or, hell, I don't know. Still I'd go again. I say no since most of my friends go out to eat to avoid cooking their own food. After all, isn't that the point of going out? The meat is of good quality but if you have a good grocer nearby and a grill, you cn do this at home. The truffle fries are very good. Standing over a grill, watching my food cook and then have others come back and look for grill space due to their under cooking was enough for me to do this once. It was extremely pricey considering you are cooking your own food. The creamed spinach was cold in the middle, and the parmesan cheese wasn't even melted on top. The steak had a lot of gristle. Always great to eat here! Very disappointing prime strip steak. Side vegetables arrived long before steak was ready, so cold . Would not recommend. Great experience. Thank you! Will return definitely. We sat at the bar and watched the NBA ALLSTAR game while eating great steak! Fantastic service, only downside was the grill was crowded. Really fun place for groups and families. My boys learned to grill here over the years--now they are 17 and 20--and still love to come. Great ambiance--really friendly--fun.